" Man cannot live on chocolate alone, but woman sure can "
Add the chocolate and sugar. Stirring constantly, cook until the chocolate melts. Add the strawberry essence & pink color. Pour into the mug or cup. Serve it with whipped cream and white chocolate curls, if desired. Enjoy!!! looks tempting and yummy !!!!! Beautiful shade of pink and looks delicious. My boys would love this! I would love for you to visit my new food blog, The Sweet Spot, and link up your recipes to my Mouthwatering Monday Link Party! wonderful chocolate drink !! lovely color and looks very tempting !! Thanks for linking to the event !! really loving this so much. 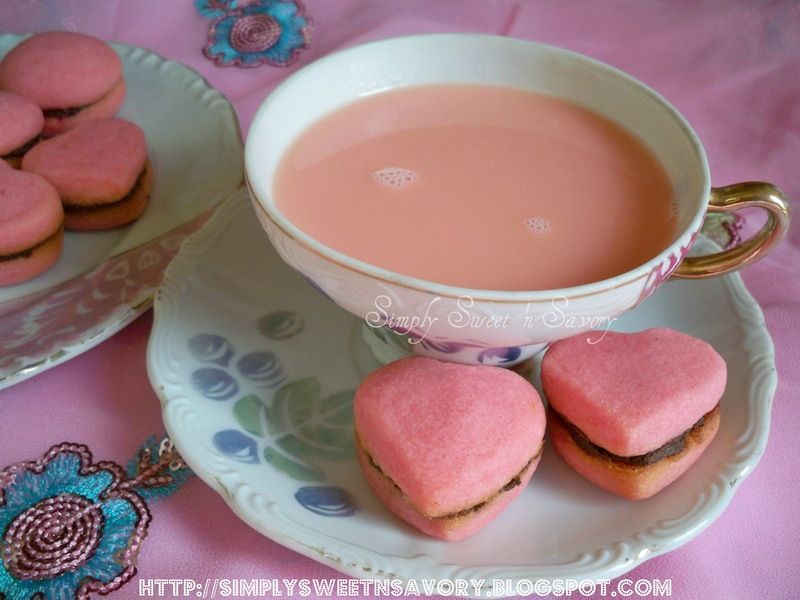 Simply amazing looking chocolate drink in pink color. Perfect for this festive time! How sweet Ambreen! looks really lovely and white chocolate is my favorite, I have a new FB page I hope you can "like" it , thank you! Another thing I would never have thought to colour! You have so many great ideas Ambreen!! My daughter will go crazy over this! Link it up tomorrow at my famous linkz party!! This is so cute and festive! :-) I hopped on over here from Frugally Sustainable. How Cute! And strawberry! Can't beat that! That is so amazing. So delicious... so... am so speechless. thanx for linking it to the event dear..! What a perfect way to comfort ones self!! Delicious! This looks amazing. A perfect for Valentine's day. VERY PRETTY and wonderful with the cookies! 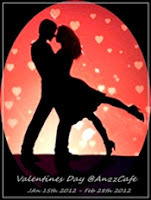 Great post for Valentine's day! my kid would love this, he lives off of strawberry milk. Pleasant looking hot chocolate Ambreen! what a perfect valentine's treat! great for a Galentine's Day party!!! this looks so sweet!!! ill be trying this! Gosh! This is so cool! Wow...looks delicious dear...loved the color ! Wow...loved the hot chocolate...such a vibrant color! This would be a perfect treat for Valentines Day, what a great idea! Hope you have a fabulous week end and thank you so much for sharing with Full Plate Thursday. I am pretty sure this is awesome. We have a link party ending tonight... would you like to add it to our link party too? You could be featured next week! Looks so good! I’d love for you to come link this post up at From Scratch Friday (live now on the blog!). Ooh, that's so pretty! Looks delicious! So pretty, would be perfect for a little (or big) girl's party! This is so pretty! What a great treat for Valentines. Thanks for sharing on Crazy Sweet Tuesday! I love this! Id never though about pink hot chocolate. I'm a new follower, I found you on Simply Designing. I hope you've had a great weekend. Pink hot chocolate sounds so much like rose milk. 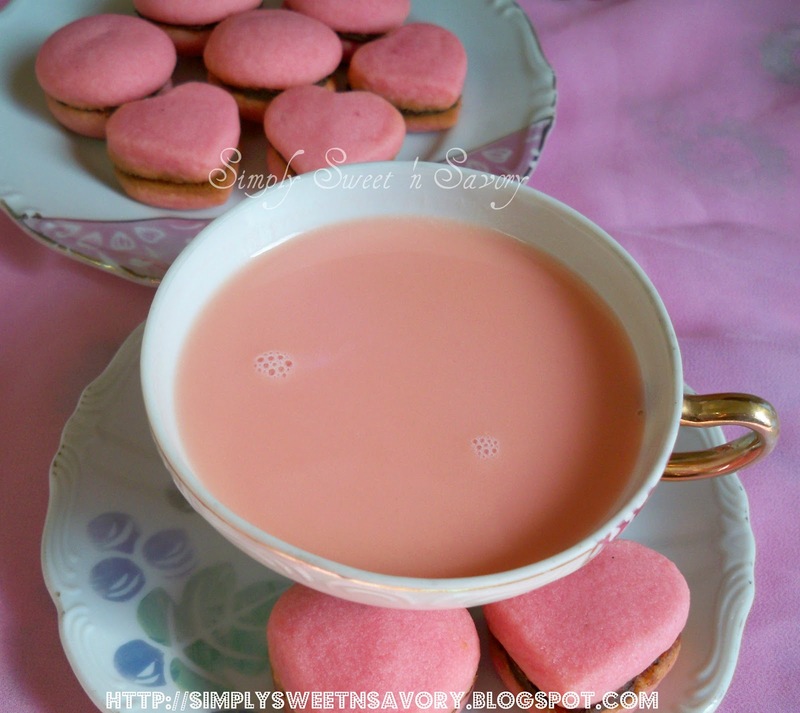 I want to gulp it down with those cute heart cookies. Also, gorgeous pictures and styling! Dearest Ambreen!! I havent been able to visit ur space lately... Ur pink chocolate is so tempting!!! So pretty...makes a fun and festive treat! Thanks so much for sharing at Shine on Fridays!! My three year old just peaked over my arm and asked me to make her some of this pink "tea"! I am thinking we need to have a little girly tea party! 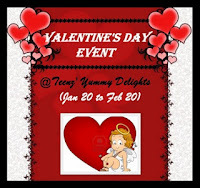 I just love how sweet this is, your awesome blog design and all the yummy goodies you made for Valentine's! If you have a chance we'd love to see some of your projects on my Tuesday linky party! Destination: Inspiration at Teagan's Travels. My niece will go crazy for this she so loves anything pink :) Lovely idea! 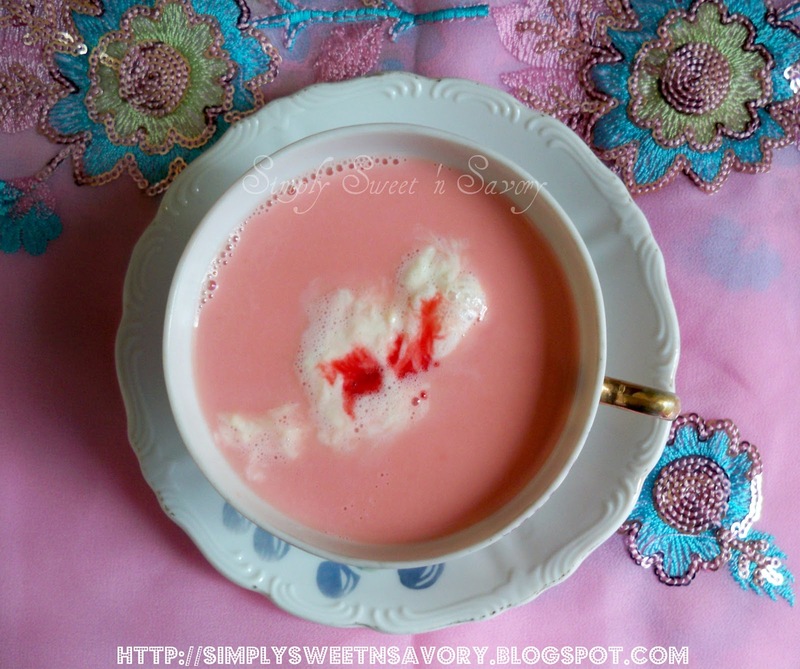 I've never seen a pink hot chocolate, I L-O-V-E it! You and I definitely have somehting in common - we both love pink! Oh wow, just when I thought it couldn't get any better you post this!!! Heaven in cup. I think my daughter will go crazy when I serve her pink hot chocolate! Looks really good! 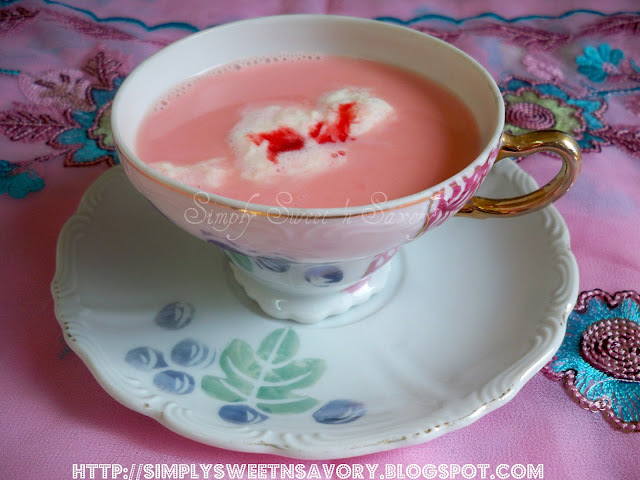 I read about pink hot chocolate drink on another blog too. But yours seems really colorful and sweet. Thanks for sharing! Saw this through FoodBuzz...........congrats on being featured on the Top 9 !